Opportunities like this are almost unheard of. Never sold before, this idyllic Georgian, former rectory was built around 1812 to impress, set centrally within gloriously established gardens of nearly an acre, and lying in an unspoilt farm hamlet, up a long tree-lined drive between Falmouth and Constantine and about five miles from the Helford River. It is part of a privately owned small country estate with the Grade II listed Bosvathick House and gardens at its heart, built in the 1760's by the same family that resides there today. Requiring some restoration, Bosvarren House is an absolute gem: stylish, spacious and original with four double bedrooms and a sociable family kitchen. A lovely undeveloped cobble floored garden basement gives scope and flexibility to this outstanding country home. THE LOCATION Most of us will not have experienced Bosvarren; discreetly accessed off the Falmouth to Constantine Road through granite posts and along a tree-lined drive to a small handful of 16th and 17th century homes in the Cornish countryside. This enchanting farm hamlet is part of Bosvathick, a traditional Country Estate, still privately owned by the family who built it in 1760 and reside in the main house today. The site at Bosvarren, its field names and features of the farm go back eight hundred years although the farm was rebuilt in the 16th and 17th centuries. Bosvarren's setting is idyllic but also accessible. It is about five miles from the Helford River and close to the harbour, town and beaches of the old sea port of Falmouth. Nearby Constantine village has a lovely community and good local facilities including a Primary School, shops, church and pubs including the well-known Trengilly Wartha Inn. Helston market town is 5 miles away whilst Truro Cathedral City is about 14 miles. THE PROPERTY Bosvarren House was built around 1812 to impress and is the jewel in this enchanting farm hamlet's crown. It has a quality and honesty that is so refreshing to see and indeed the detail of its Grade II listing notes how much of the originality and its detailing survives. The house is stylish and spacious, set over three floors although the garden basement is unused. 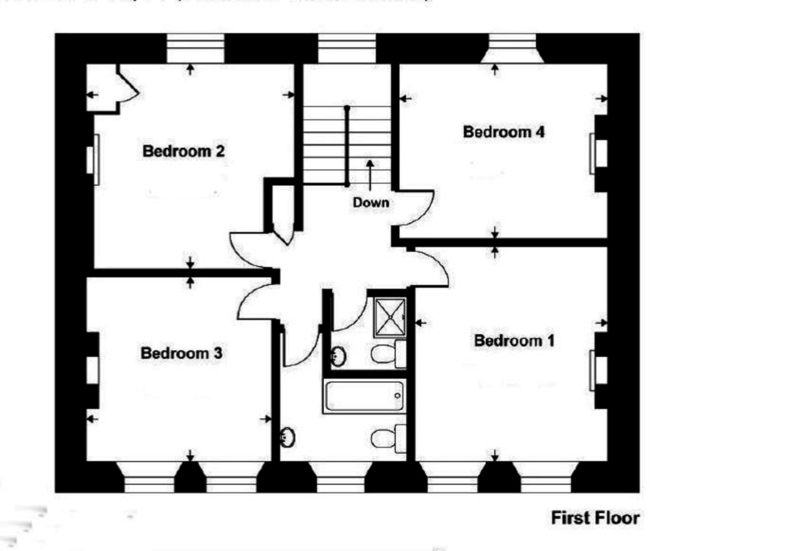 There are four double bedrooms and four reception rooms plus a family kitchen/dining room likely to be the social hub of the home. Bosvarren House stands in the middle of long established and delightful, almost level gardens full of flowering shrubs, with areas of lawn, raised beds and mature trees making it varied and interesting. The south front looks over the garden and has wide granite steps and a fine granite ashlar front. The house has shutters and window seats to all the sash windows. The central hall has the original front door and fanlight, and there are many other fine features including mahogany doors and original fireplaces, one of which has an inset woodburning stove. There is a dining room, a sitting room with fine cupboards, a drawing room and the original Turkish style arch to a study area. There are two driveways with much space to park vehicles. This handsome country house is perfectly comfortable and liveable 'as is' and has recently been re-roofed, but we believe it is in need of some love and attention in order to realise its considerable potential and to become a very special and indeed magnificent home in which to live. HALLWAY About 22' (6.71m) deep x 5' 5" (1.65m) Exposed boards, picture rail and corniced ceiling. Radiator. Mahogany panel doors to two sitting rooms and dining room through to kitchen. Turning staircase to first floor. 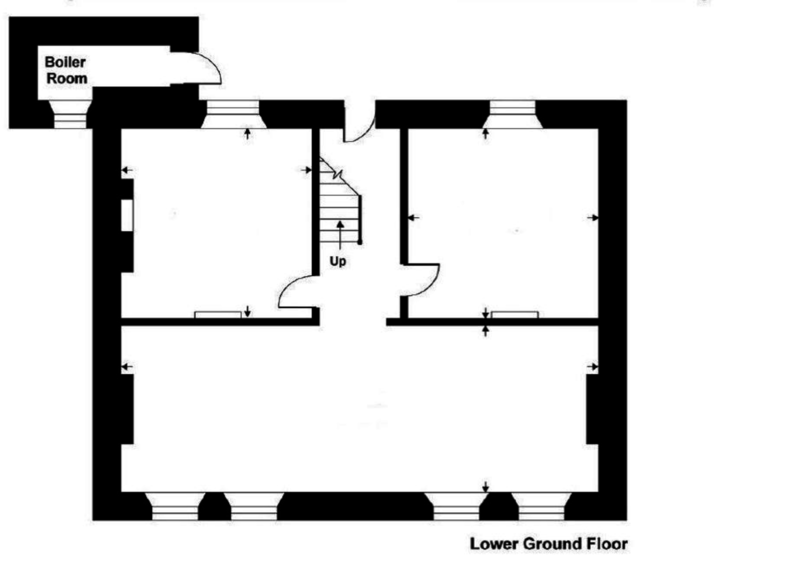 Doorway and staircase down to basement. STUDY 13' 10" x 7' 5" (4.22m x 2.26m) Sixteen pane shuttered sash window with seat, facing the rear garden. Fine original built-in glazed cabinets and cupboards. Open fire place. Radiator. Dado rail. SITTING ROOM 12' 8" x 10' 10" (3.86m x 3.3m) Twin twelve pane shuttered sash windows with seats overlooking the front garden. Fireplace and original built-in cupboards and glazed cabinets. Radiator. Dado rail. FAMILY KITCHEN 20' 6" x 10' 10" (6.25m x 3.3m) With three, twelve pane sash windows to side and rear, doorway to rear entrance. Modern cream, shaker style kitchen with base and wall mounted units and solid wooden worktops incorporating a Belfast sink. Built-in oven, grill and hob. Old cream Rayburn Royal stove. Space for fridge. Radiator. Ceiling spotlights. UTILITY & CLOAKROOM Side facing windows. Plumbing for washing machine. Cloakroom with white WC and wash hand basin. Electric panel heater. BATHROOM Front facing twelve pane shuttered sash window with seat. White WC, wash hand basin and metal panel bath. Tile surround. Radiator. SHOWER ROOM White WC, wash hand basin and walk-in tiled , boiler fed shower. BEDROOM ONE 13' 10" x 12' 8" (4.22m x 3.86m) Twin twelve pane shuttered sash windows with seats to front. Open fireplace. Radiator. BEDROOM TWO 13' 4" x 12' 6" (4.06m x 3.81m) Rear facing sixteen pane shuttered sash window with seat. Open fireplace. Original built-in cupboards. Radiator. BEDROOM THREE 13' 8" x 11' 5" (4.17m x 3.48m) Rear facing sixteen pane sash window with seat. Open fireplace. Radiator. BEDROOM FOUR 12' x 12' (3.66m x 3.66m) Twin front facing shuttered twelve pane sash windows to front. Boarded fireplace. radiator. 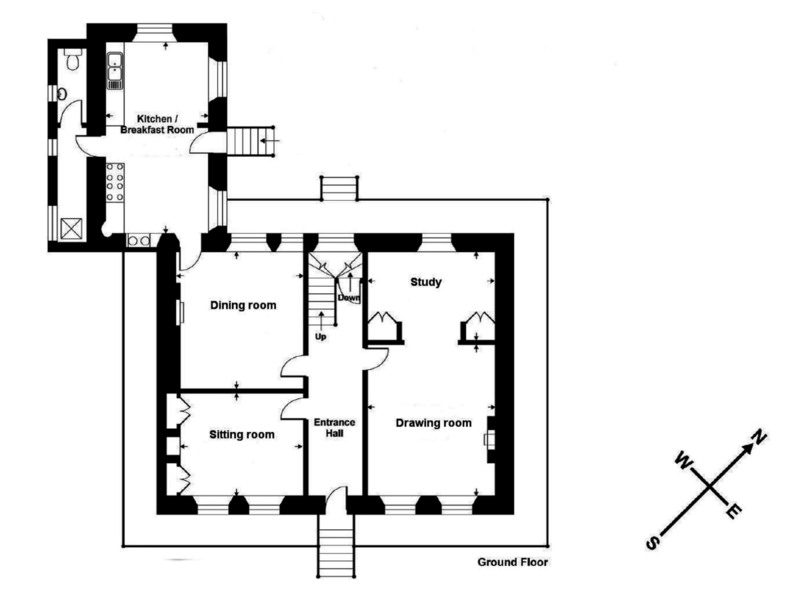 LOWER GROUND FLOOR From the hallway, a door and stairs down to a lower hall with granite flagstone floor and doorway outside to the rear. The garden basement comprises three rooms and provides such scope to incorporate into the main accommodation, to create self-contained accommodation with independent access or indeed for any number of uses such as for hobbies or a spacious work from home office. All subject to consents. ROOM ONE 32' x 12' (9.75m x 3.66m) Cobble stone floor. Twin six pane sash windows to front. Electric Consumer Unit. ROOM TWO 13' 10" x 12' 4" (4.22m x 3.76m) Twelve pane sash window to rear. ROOM THREE 12' 5" x 10' 10" (3.78m x 3.3m) twelve pane sash window to rear. Original open fireplace. OUTSIDE Bosvarren House lies within a gloriously established. almost level 0.9acre Cornish garden richly stocked with many fine trees and choice shrubs including so many magnolia, rhododendron, camellia, hydrangea and azalea. Lawns are carpeted in primrose and wild flowers with pathways meandering around with evidence everywhere of its 200 years of planting and evolution. Quality pervades with much old granite in evidence including the rear flagstone and cobbled terrace, steps and thresholds and the many staddle stones about. Much of the garden is surrounded by Cornish hedges whilst all around there are small hedges and raised borders for structure and interest. There are two entrances with granite posts, one with a gate, leading to areas with plenty of space to park and provide garaging if required, subject to any necessary consents. GARDEN STORE 12' x 8' (3.66m x 2.44m) Galvanised. BOILER STORE Granite flagstone floor. Oil fired boiler fuelling radiator central heating and hot water supply. Oil storage tank.